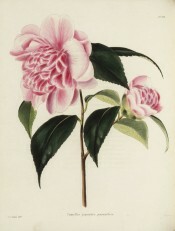 A cultivar of Camellia japonica L., ‘Peoniflora pallida’ is intermediate in colour between ‘Paeoniflora rubra’ and ‘Pompone’, which see, and is a sport of the latter. The petals are deep blush, veined, the edges almost white. [ICR]. It was imported from China by the Horticultural Society in 1820 and first described in the Transactions in 1830. [ICR]. This data seems at odds with its origin as a sport of Pompone given in the ICR. Listed in all published catalogues [T.247/1843]. Berlèse lists both Paeniaeflora rubra and Paeniaeflora rosea, or rubra in his Monography. The former is described under Camellia japonica L. var. peoniflora rubra, which see. The latter may be Paeoniflora pallida. ‘Leaves two inches broad, and two inches eleven lines long, and often of larger dimensions, elongate-oval, acuminate, glossy, a little dentated, of a delicate green; a vigorous shrub, has a tendency to extend its branches and requires to be pruned every three or four years, to give it a graceful form; bud large, rounded, scales green; flower full, four inches in diameter, and sometimes larger, of a lively rose, No.4, often of a cherry red, No.2; petals of the circumference rounded, broad, those of the centre rolled in the form of a cornet, numerous, narrow, close, erect, rather long, and form a sphere, a little depressed. – Superb.’ [Berlèse Monography p.53/1838]. This description is almost identical to that given for Paeniaeflora rubra [Berlèse Monography p.68/1838]. It seems likely that they are the two colour forms given in both descriptions, ‘lively’ or ‘vivid rose’ and ‘cherry red’. The flower represented here by an image from Loddiges Botanical Cabinet, called Camellia japonica paeonaeflora, is probably the form known by William Macarthur as pallida.